A new trailer has come out for the new Dragonball Z film, "Battle of Gods". Obviously, I have no idea how to speak Japanese, and have no idea what they are saying, but I grew up on Dragonball Z, and hope that an English dub is released, because I will certainly check it out. However, I find the villain to be an odd choice. He (maybe she? I don't know) looks like a cross between Jaxxon (look him up-yes, you are actually seeing that) and the Egyptian God, Anubis. But to be fair, Dragonball's choice of villain appearances have been stranger....I'm looking at you, Majin Buu!!! 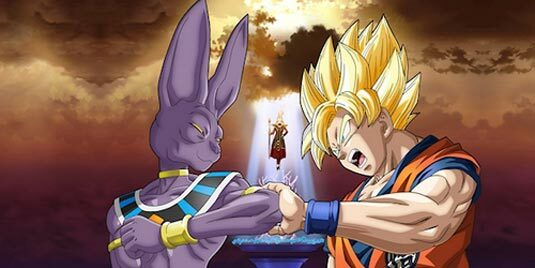 So all you anime and Dragonball fans, be on the look-out for "Dragonball Z: Battle of Gods"